Meatballs Sans Gross Flecks of Green: As a rule, I don’t really like meatballs at all, but I like them even less when they feature flecks of leafy green stuff. I don’t care if parsley or basil adds flavor – it looks nasty. 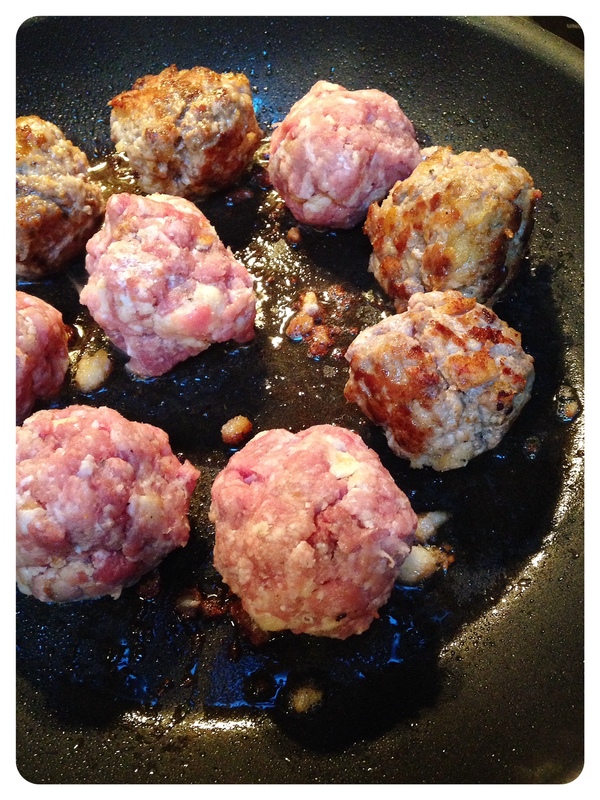 Pan-to-Oven Meatballs: A nod to the cooking method, perhaps? All in all, the more I sit here and try to figure this out, the more I realize that I absolutely hate the word “meatball”. Seriously. 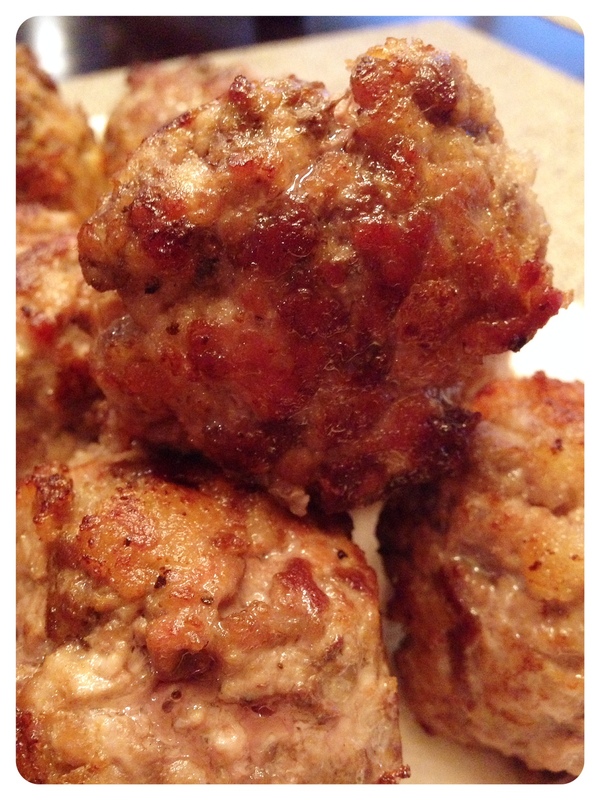 These…meatballs (that word!) are simple to make as they quickly sear in the pan and finish in the oven. If you are going to add these to a sauce, my recommendation is to take it easy on the baking time because the meat will continue to cook in the sauce and add flavor as it cooks. 4 Tbsp. Heavy Whipping Cream – As close to room temperature as possible. 3 Lbs. Meat – 1 lb. each of ground pork, ground beef (not going to lie, I use ground chuck for this, but you can go leaner if you like) and veal (if you can’t do veal, try either chicken or .5 lb each of pork and beef). 1 Cup of Grated Pecorino Romano Cheese (or Parmigiano Reggiano…if you use this, you might need to up the sea salt content later). Stainless Mixing Bowls – One large and one medium size. Plate – Cover with a paper towel. Baking Sheet – Don’t cover this in foil. Crush the garlic croutons finely. You can do this right in the medium mixing bowl with your meat mallet. Set aside. In the medium bowl, pour the heavy whipping cream over the crushed croutons and mix until the croutons are just coated. Don’t make a paste. Mix the coated croutons, meat, and cheese together along with salt and a touch of pepper. 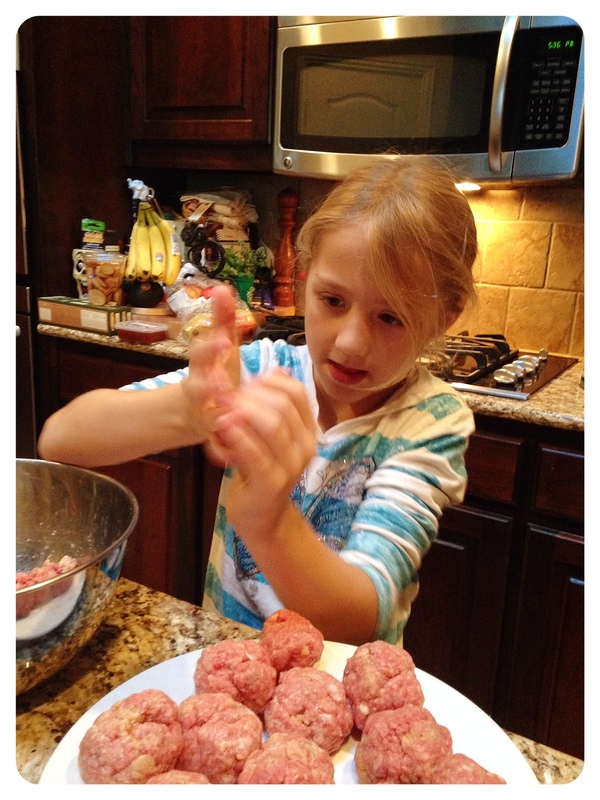 Using your hands (or the hands your little sous chef) form the meatballs. In terms of size, you should strive for consistency and my preference for the sake of cooking and doneness is about 1/4 cup of meat per meatball. On the stove top, drizzle a bit of olive oil into your pan. Don’t use too much because you are searing, not frying. There’s plenty of fat in the meat and it is ok to have brown flecks in the pan. Remove each meatball to your plate and allow the meat to drain. Once you have seared your whole batch, rub just a touch of olive oil on your baking pan and place the meatballs on the pan so that none of them are touching. Bake at 400 degrees for 10-15 minutes until cooked to desired doneness.